Small in size, but big in capacity. Perfect for large aquariums. Designed for commercial and residential. Using Reverse Osmosis Technologies. No equipment is more effective in helping create ideal water conditions as Reverse Osmosis (RO) units. These units filter out up to 99% of chemicals found in tap water by forcing tap water through a semi-permeable membrane that removes 90-99% of tap water impurities. Enjoy an unlimited flow of fresh purified water with the PurePro FS8000-Direct Flow RO/DI system. System is equipped with high flow booster pump for increased water production capacity. It is perfect for areas with low water pressure. Integrated diaphragm pump increases water pressure to maximize production without having to purchase a separate RO pump. Tap water often contains impurities that can cause problems when added to an aquarium. These include phosphate, nitrate, chlorine, and various heavy metals. High levels of phosphate and nitrate fuel aggressive algae growth, and copper, often present in tap water due to leaching from pipes, is highly toxic to invertebrates. 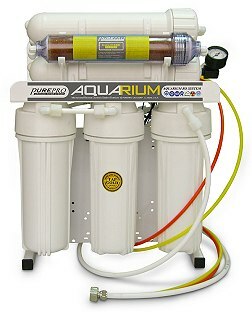 Because RO filters remove practically all of these impurities, they are becoming more popular among aquarists, particularly marine hobbyists.